Nothing makes you say olé! in the morning more than saucy black beans, salsa and scrambled eggs. 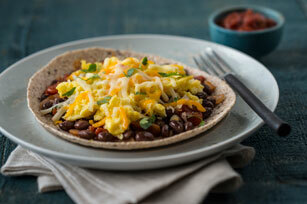 You'll love our Open-Face Huevos Rancheros recipe! Heat oil in medium skillet on medium heat. Add onions; cook and stir 5 min. or until crisp-tender. Add beans and salsa; cook 3 to 5 min. or until heated through, stirring frequently. Meanwhile, cook eggs in skillet sprayed with cooking spray 5 min. on medium-low heat or until set, stirring occasionally. Place tortillas on serving plates; top with bean mixture, eggs, cheese and cilantro. Serve with fresh fruit and a crisp mixed green salad. Stack tortillas, then wrap in foil and bake in 350ºF oven 10 to 15 min. or until heated through. Or, stack tortillas on microwaveable plate and wrap loosely in waxed paper. Microwave on HIGH 30 sec. or until heated through.